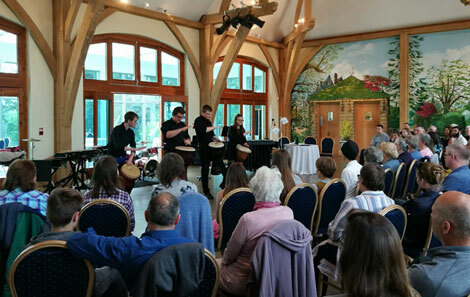 Last weekend College percussion group Quartet19 launched the Next Generation project with music and arts organisation, Menter Rhosygilwen in Pembrokshire. This is a new collaboration with the College, aiming to help enrich the cultural life of the area by bringing outstanding artists and performers from both Wales and across the world. As well as showcasing its ensembles, College students will be working with local secondary schools and colleges, giving young people the chance to experience live, exciting and diverse music, both as audience members and through workshops. The featured photo shows the members of Q19, students James Harrison Luke Baxter, Jemma Sharp and Iolo Edwards. 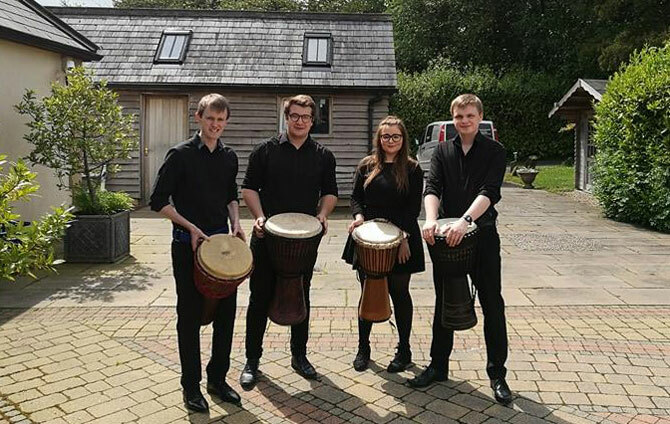 “It’s fantastic to see this exciting collaboration between our vibrant Percussion department and the dynamic team at Rhosygilwen,” said Head of Music Performace, Kevin Price. “The project brings the life and energy of our young professionals to an area which is rich in natural beauty and in natural musical talent. Q19 also works closely with Children’s Musical Adventures, a company which aims to inspire as many young children as possible to engage in music through workshops in schools as well as relaxed family concerts. They also work with Live Music Now Wales to deliver interactive concerts in care homes and schools across Wales. Working with Owen Gunnell (one half of O-Duo) Q19 has produced family concerts and workshops at the College, and recently at the Cambridge Summer Music Festival. You can find out more about them at www.quartet19.com. The events at Rhosygilwen are also open to the public.